This paper analyzes Carmen Miranda’s trajectory by situating it in the broader context of the disputes about Brazilian nationality between 1920 and 1940. At the intersection between her career and the Brazilian political culture of her time, the paper discusses her role in mediating the symbols that contributed to a particular national project that made the samba the country’s unmistakable trademark. Cet article analyse la trajectoire de Carmen Miranda en la situant dans le vaste champ de controverses sur la nationalité brésilienne entre 1920 et 1940. Au croisement de sa carrière et de la politique culturelle brésilienne de l’époque, l’article discute son rôle de médiateur de symboles, lesquels participent d’un projet national particulier qui fait de la samba l’incomparable marque de fabrique du pays. 1 A person from Rio de Janeiro. 2 A person who dances the samba. 3 Shanty town or slum. 1“What matters is what the Americans call ‘environment’, the influence of the country and the customs that made us. I am much more a carioca,1 more a sambista2 from the favela,3 I have more to do with carnival than fado.” This statement by Carmen Miranda at the end of her life touches on one of the most significant (and most sensitive) aspects of her trajectory: the issue of her national identity, as she experienced it throughout her life, and as it was dramatically echoed by the important identitary project embraced by the Brazilian government during the 1930s and 1940s. 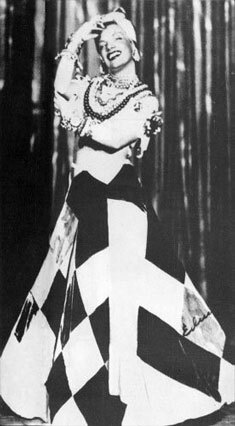 2Carmen Miranda, with her Portuguese origins, Brazilian life, Carioca spirit, American dollars, the “South American Way” and her Baiana clothes (see ill. 2), turned her career and her biography into an exemplary and pioneering case of mid-20th-century cosmopolitanism. Today, as we commemorate 100 years since the birth of the most international of all Brazilian women (or should we say Portuguese? ), we remember her name as a symbol of both localism and internationalism in a formula as complex as the cultural dynamics inherent to the phenomenon of cosmopolitanism. The radical “Brazilian-ness” of the proto-Baiana turned her status as a foreigner into her greatest asset in Hollywood. Though, at the time, this characterization led Brazilians to doubt the legitimacy of her ties to the national culture that she evoked with so much love, because the image that she projected often lacked a supposed authenticity. 3In both Brazilian history and memory, words such as embarrassment, pride, polemics, caricature, alienation, pioneerism, daring, originality and artificiality are commonly used to refer to the myth embodied by the persona of Carmen Miranda. In the wake of the development of the Carmen Miranda myth—an ever-present figure in the national imaginary—the restraint with which her centenary was celebrated at the beginning of this year speaks volumes. Stimulated by these issues, my aim here is to outline some reflections concerning the trajectory of Carmen Miranda, the first Brazilian (or even Latin American) star. My analysis consists in examining the complexity of local/cosmopolitan dialectics, together with biography/national identity duality, whilst avoiding the antagonism with which these issues are frequently approached. In this way, I intend to carry out a historic-anthropological reconstruction of a process in which a large part of the Brazilian socio-cultural agenda is still immersed. In order to do this, I have divided Carmen Miranda’s trajectory into three different phases, each associated with specific points in the equilibrium between the dialectics mentioned above. I have chosen to study her trajectory by analyzing the songs Carmen recorded during each phase, in order to shed light on the indissoluble relationship between her trajectory and the identitary context on which this study is based. 4I would like to emphasize that, as Gilberto Velho aptly expressed it, adhering to this principle means treating “artists as individuals who negotiate and create their unique identity within the culture, the set of social codes and the relations of which they are part, and which are transformed by their artistic contribution”. By the same token, I consider that “artists are creative subjects who can only be fully understood by analyzing the socio-cultural space (traditions, customs, patterns and values) to which they belong, not as automatons, but as re-inventors of codes and languages” (Velho, 2006: 140). Therefore, before we follow the trajectory of Carmen Miranda’s life and work, it is worth asking which socio-cultural spaces she experienced, and which set of codes and languages she manipulated in her ever-frenetic way. 5Born in Portugal, in Marco de Canaveses (a district of Porto) in 1909, Maria do Carmo Miranda da Cunha arrived in Rio de Janeiro when she was only a year old. The city she came to know was going through an intense process of urban expansion and rapid growth, with a population of over one million which continued to grow rapidly. Population growth and an increase in the number of inhabited areas were accompanied by problems inherent to large metropolises. In the 1910s, Carioca cosmopolitanism was expressed, not without a certain discomfort (according to various chroniclers of the time), through French and English clothes, words and customs. Gilberto Freyre (2007) called this process “re-Europeanization” when analyzing the decline of the patriarchal society in the mid-19th century, when being of Portuguese descent was increasingly seen as somewhat undesirable. However, in an ironic twist of history, it was a Portuguese woman who was to become one of the most important vehicles for Brazilian identity in the modernizing rage of 20th-century Brazil. 6There are many stories that reinforce the myth about the natural “talent” of the young Carmen, who from a very early age spent her days singing and charming the clients of the various shops in which she worked. For my present purposes, I am not interested in reiterating or questioning the biographical idiosyncrasies of a young girl whose childhood was typical of a Carioca of her time, regardless of her precocious artistic leanings. It is nevertheless essential to understand the context, or more precisely the field of possibilities, which made it possible for a young girl from the incipient urban middle classes—through her voice and a repertoire often borrowed from unknown songwriters—to become a symbolic prototype of nationality and, at the same time, a stereotype of inauthenticity. 7During the “frenetic 1920s” Carmen Miranda grew up surrounded by cars, modern magazines and the thrill of cinema, which was then becoming popular, as well as the growing influence of American culture. She saw a rapid increase in the pace of life and in the number of magazines and photographs at a time when the motto “modernity”, and to no lesser degree “modernism”, was redefining the boundaries between the national and the foreign. These were the days of the melindrosas (delicate young ladies) and the almofadinhas (dapper gentlemen), but also of regionalisms, and of jazz and the foxtrot. And this was, without question, the time of samba. 4 Written by Joubert de Carvalho. 5 Carmen Miranda’s first two records were released in 1929. 8In order to understand the symbiosis of Carmen’s biographical trajectory with the identitary trajectory of the nation, we need to return to the carnival of 1930, when the marchinha (Carnival March) “Pra você gostar de mim” (Taí)4 became the hit of the year on the streets of Rio de Janeiro. This song, which appeared on Carmen’s third record,5 put her name on everyone’s lips and all over the airwaves. Six months later, Carmen Miranda was described by the newspaper O País as “the greatest Brazilian singer”. Que eu fique na minha terra permita Deus, Nosso Senhor! Let me stay in my country, I beg you God, our Lord! If we begin with the title, the first thing that stands out is the fact that Carmen insists on claiming she is Brazilian, which would not be strange were she not Portuguese. Along with Carmen’s affirmation of her biographical identity is the celebration of national identity based on the uniqueness of the “Brazilian race”, which has its utmost expression in the “singularity of samba”. Carmen is therefore doing two things here: she is defining samba as a legitimate symbol of the uniqueness of Brazil, whilst at the same time seeking to show her “natural” connection to the rhythm (and consequently to Brazilian nationality). 10Eu gosto da minha terra was recorded in the same year that Taí burst on the scene. It was at this point in the beginning of her career, when she was still unknown to the general public, that her record company (RCA Victor) told her that she should not reveal her Portuguese origins. She refused and soon came in for criticism. Orestes Barbosa, then a well-known journalist and songwriter, succinctly expressed the feelings of much of the public: “She is so Carioca in the sweet and impish way she pronounces things, so lively and so unique when singing her great hit Taí that no one would have thought that Carmen Miranda was born in Portugal, because Portugal does not provide us with sensations, with hits” (Barbosa,  1978: 58). In this context, Eu gusto da minha terra was her first response to suspicions regarding her proud “Brazilian-ness”. 11However, it was not only her origins that were questioned. Her recording contract specified that she had to cast aside the various tangos that had always been part of her repertoire. They were replaced by sambas and though this genre did not yet have a well-defined rhythmic identity, it did carry the label “Brazilian”, albeit in a vague and abstract way. In the years that followed, the singer, who was only 152 centimeters in height, used her grace and charm to popularize samba to the point of banality. She brought to the stage the duality between the morro (favelas) and the city (associated with foreign high culture), as well as other themes such as the baiana, populist-nationalism and carnival. The order of the day was to “nationalize”. 6 In French in the text. 12Therefore it is no mere coincidence that the explosion of the Carmen Miranda phenomenon occurred in the same year that Getúlio Vargas came to power. Despite the fact that hybridism and in large part the celebration of “national authenticity” are not the result of any particular type of historical-cultural upheaval (in fact, it is not difficult to find evidence of this process in antiquity), it is important to recognize the significance of the so-called “Revolução de 30” [1930s Revolution] for the consolidation, if not the institutionalization, of these phenomena. The coup d’état,6 which turned the previous republican regime—as it was known up to then—into the “Old Republic”, imposed a definite identitary policy on the nation with an emphasis on homogeneity, in a clear attempt to find a new balance between tradition and modernity. The October Movement was not an absolute beginning, nor was it the first and physical cause of anything, because in history these things do not exist. But it was a catalyzing axis around which Brazilian culture turned, catalyzing dispersed elements and placing them in a new order. In this way, it was a historical landmark which made us clearly feel that there was a “before” which was different from an “after”. This was largely because it created a movement of cultural unification, projecting onto the nation facts which occurred at a regional level. To this integrating element we need to add another, just as significant: the emergence of the conditions for carrying out, disseminating and normalizing a number of aspirations, innovations and premonitions generated in the 1920s which had been a breeding ground for many significant changes (Candido, 1984: 27). 14Among the conditions to which Antonio Cândido refers are the development and popularization of radio and the record industry in Brazil. Radio, which is unquestionably more democratic, faster and more powerful than the press, arrived in Brazil during the 1930s and became the main agent in a fundamental revolution in communication, paving the way to the establishment, by the 1950s, of a “culture industry” (to use the term of the Frankfurt School) in Brazil. Thus, Carmen Miranda’s success can only be understood as immersed in this process of technological innovation and a set of political and ideological predispositions, in which radio emerged as a unifying element, turning the urban carioca samba into Brazilian national music. It is for this reason that the anthropologist Hermano Vianna argues that a fixation with a particular model of music (the urban carioca samba), discussed and produced by different elements in society, was also a “victory for the process of nationalization and modernization of Brazilian society” (Vianna, 1995: 127). 15The debate around the process of “nationalizing” samba—transforming a musical genre that remained obscure throughout the 1920s into a symbol of “Brazilian-ness”—has been long-standing and polemical. Nevertheless, there is consensus on the fact that during the 1930s, samba established itself as the national rhythm and became “a central element for defining national identity” (ibid. : 28). It is not the purpose of this article to discuss (or explain) this process, which Vianna calls “the mystery of samba”, although we should remember that this is almost automatically associated with mottos such as favela and more generally with everything related to “popular culture”. From the 1930s onwards, Brazil moved towards the legitimization of the “hybridism” motto as the trademark of national uniqueness. 16It is nevertheless intriguing that samba, which at that time started being adopted as the symbol of “Brazilian-ness” and followed the prescribed identitary formula—that is, of hybridism and mestiçagem—, would have the European-looking Carmen Miranda as its face abroad.7 This makes it very clear that the process of nationalizing a supposedly homogeneous identity necessarily involved an image-internationalization process in which the “popular” would not be in opposition to the “civilized”—that is, a process in which the “traditional” would perfectly complement the “modern”. 17It was in this climate of nationalism and modernization that Carmen reaffirmed the value of the national in face of foreign culture. In music this was represented by the conflict between samba and the foxtrot. In 1931, Carmen Miranda was proclaimed “the Ambassador of Samba” and embarked on a de facto diplomatic mission, touring neighboring countries and establishing an especially close relationship with the Argentinean public (a country she visited no less than eight times up to 1938). She also toured Northeast Brazil with a similar aim, namely to make it clear that the “Ambassador of Samba” was also, in practical terms, the Ambassador for the type of nationality that should be coveted. 8 O Cruzeiro magazine, 21/10/1933. 19The famous image of Carmen dressed as a baiana would only emerge in 1938, in Banana da Terra, the sixth film in which she appeared. For the first time, the carnival costume portraying the prosaic image of black women with their tabuleiros [trays] became something glamorous. Carmen danced to the sound of Dorival Caimmy’s O que é que a baiana tem? [What Is It about Bahian Women? ], challenging the stigma associated with the clothing worn by black slaves. Thus here, instead of pointing out the supposed signs of in authenticity or incoherence, it is more important to note the plural and complex aspects of the phenomena, which—like Carmen’s Baiana—bring together different currents of cultural tradition (Barth, 2000: 123). Barth argues that this implies thinking of culture as a motto that can only be correctly interpreted when it is linked to the “context, praxis and the purpose of communication” (2000: 131). The success of Carmen’s persona led to a reinterpretation of baianas in musicals staged at Rio de Janeiro’s Teatro Municipal and at the Cassino da Urca. 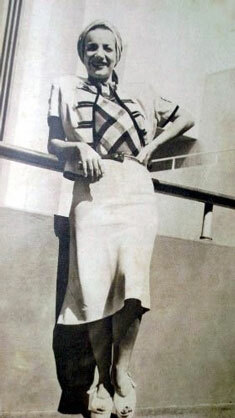 It was at Urca that, in 1939, an American businessman scouting for exotic types for Broadway magazines saw Carmen. A few weeks later, after signing a lucrative contract with Fox, Carmen took her stylized baiana to the United States. Eight years had passed since Carmen—now extraordinarily popular and about to leave for the United States—had first sung Let Me Stay in My Country, I Beg You God, our Lord! I am going to New York to show them the music of our land. […]. Sometimes I am scared of the responsibility I carry, but when the time comes […] I feel the warmth and support of my friends, who hear me now and who give me the strength to reply with the “it” that you all know so well. Remember me, always, as I will never forget you. 9 Carmen Miranda’s debut on Broadway in 1939 was in the show Streets of Paris. Carmen and her baiana left for the United States on the eve of the Second World War, a time when the “good neighbor policy” was firmly in place. Implemented by Franklin Roosevelt in 1933, and lasting until 1945, it advocated against the American interventionism in Latin America that had prevailed since the end of the 19th Century. It also promoted economic and military collaboration in order to block European influence in the region, maintain political stability on the continent and guarantee American leadership in the Western hemisphere. It was against this background that Carmen arrived in the United States as a de facto link in the diplomatic chain, in a political context that must be taken into consideration to understand her astounding success, first on Broadway9 and later in Hollywood (Mendonça, 1999). While the United States was importing a symbol of “Latinity”, the Brazil of Getúlio Vargas’s Estado Novo was exporting the image of the white baiana as a symbol of a proudly civilized nationality. However, behind the diplomatic harmony expressed in this two-way exchange, there was a conflict: after all, what did Carmen represent when she arrived in New York? The Latin Pan-American girl or the singing flag-bearer of all things Brazilian? This song (a fox-rumba which in no way resembles the samba rhythm) was performed during Carmen’s first Hollywood appearance. 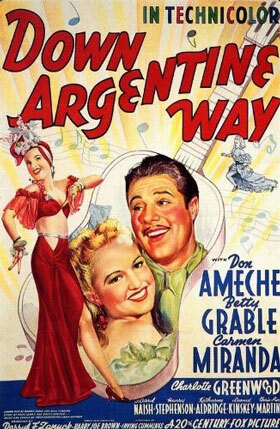 The film, shot in 1940, was called Down Argentine Way. The title speaks for itself: Carmen, in her best modernist baiana style, was presented to the American public as the recipient of a true symbolic salad, blended together by exoticism and representing a supposed Latin American unity. 22But let us return to the song. The lyrics start by announcing the “cry of the pregoneiro”, who carries in his tray such delicacies as vatapá and caruru. To begin with, the word pregoneiro does not exist in Portuguese. In Spanish “el pregonero” is the person who loudly and clearly announces the products on sale. In this case, the tray (which is an essential element of the baiana costume) “happily” [com alegria] contains food of African origin, which became popularly known in urban Brazil as typically associated with the African roots of the national culture. Out of this union between the Hispanic and the Brazilian emerges, in Carmen’s voice, a “South American Way” which is characterized at the end of the song as the “hazy, lazy, crazy” way to be. 23Throughout the 15 years that she lived and performed in the United States, Carmen reflected American impressions of Latin people. With her infallible smile and her almost childish way of speaking, she perfectly epitomized the captivating, innocent, stereotypical image of “Latinity”. Carmen was the greatest star among the many artists of Latin origin who arrived in the US during the same period. She was “the bombshell”, and this is largely due to her ability to embody the persona she had been contracted to represent. Bando da Lua introduced the Brazilian rhythm—which most orchestras still confuse with Cuban or Mexican rhythms. Without this rhythm, I would just be another Latin American singer. You know that Brazilian songs become “Cubanized” or “Mexicanized” when they fall into the hands of American orchestras. Just imagine, me singing “Tico-Tico” to a rumba beat! It’s just not possible! We need a pandeiro, a samba tambourine, a cuica and a guitar. Otherwise, it’s not Brazilian music. It may be very nice, full of rhythm, but it is rumba, guaracha or bolero. Samba is samba—and for now, only Brazilians know how to play samba (O Cruzeiro magazine, 1948). Here we see Carmen reinforcing the myth of a genuine nationality that, when expressed through real samba, was able to keep the Brazilian identity intact within the Latin hotchpotch. Along with the “national rhythm”, the singer also carried, among tambourines and guitars, the dilemmas of nationality. 10 “Batucada” is a sub-style of samba and refers to an African influenced Brazilian percussive style. 11 The samba rhythm, the percussion. 25In a famous 1940 samba (Brasil Pandeiro), which was written when Carmen went to the United States, songwriter Assis Valente said: O tio Sam está querendo conhecer a nossa batucada10. [Uncle Sam wants to find out about our batucada11] However, when looking for their national identity in the numerous films Carmen made in Hollywood (thirteen in total), many Brazilians found the representation of their nationality to be fragmentary, almost shapeless. If during the first phase of her trajectory Carmen conveyed an almost proscribed “Brazilian-ness”, now her baiana was being used to convey a foreign (even strange) image that many Brazilians did not recognize. 26It is worth mentioning that the singer did feel a certain discomfort as she saw herself being increasingly associated with a Latinity that, in the eyes of the American public, often superseded her links to “Brazilian-ness”. This was clear when she said that she “hated” the expression “Latin American”, adding: “I like to be called ‘Brazilian’, not South American, because I have nothing to do with the Spanish heritage. After all, we Brazilians are the only citizens of Latin America who speak Portuguese and we are different.” Here again we find a reaffirmation of the uniqueness of Brazil and of her association with this nation. This is clear, for example, in a statement in which she claims that “the Brazilian Embassy in the United States is not in Washington, it’s in my house” (Garcia, 2003). 27Thus, Carmen was condemned to a “double foreignness” in which the national/cosmopolitan formula was as strained as it was undefined. This “displacement”, which came to define Carmen’s trajectory, can be further analyzed through works by Simmel and Schutz on the “sociology of the foreigner”. In the view of both of these authors, the situation of the foreigner reveals a pattern of interaction that is based on a permanent tension between proximity and distance. Schutz (1979), who bases his analysis on the idea of a “cultural agenda”, emphasizes the singularity of the position of foreigners by claiming that, from the point of view of the group, they are “people without history”. As the author argues, from their first ready-made conceptions about the group to their transformation into members of the cast, newcomers experience different levels of attention and meaning, subjected as they are to a “field of adventure”. Simmel (1971), on the other hand, emphasizes a foreigner’s permanent oscillation between indifference and involvement. Treating conflict as a pattern of interaction, the author focuses on the ambivalent position of those who, despite having been incorporated into the group, continue to be in a social situation distinct from that group. According to both authors, in this way foreigners carry the tensions inherent to the process of building social relations. 28In the case of Carmen Miranda, ambivalence and tensions (literally) acquired colorful characteristics. 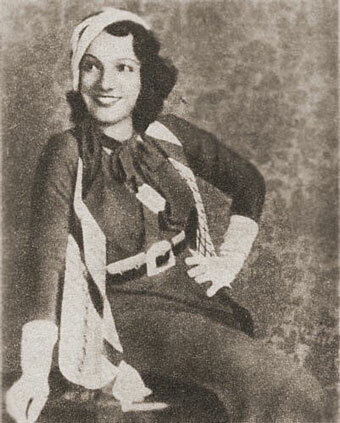 In the symbolic hotchpotch which made up her costume and her trajectory, the amalgam between “Brazilian-ness” and “Latinity” often resulted in an identity that was foreign to one and all. Aware of the polemic surrounding her (dis)placement, Carmen sent the following message to those who insisted on questioning the legitimacy of her intentions abroad: “Don’t forget that I earn money with bananas”. 29This brings us to 1940 when, after a year-long absence, Carmen returned to Brazil for a period of time. When she arrived at the airport, she was welcomed with a tumultuous reception organized by the government, where she was awarded honors that some contemporary commentators deemed totally inappropriate for a “samba singer”. With Carmen’s arrival in Brazil, we enter the third and final phase of her trajectory. 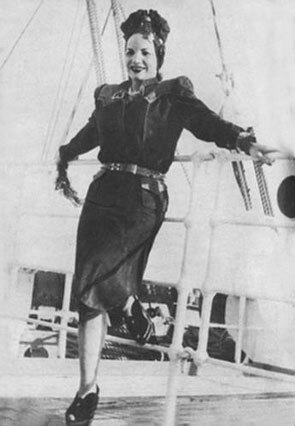 30Days after arriving in Rio, Carmen Miranda embarked on a full schedule of shows and commitments. She decided to start with a charity presentation at the Cassino da Urca, which had always been her favorite stage. Carmen walked on stage and instead of her usual “Alô, macacada!” (“Hello Monkeys!”) cried “Hello people!” and launched straight into “South American Way”. The audience, consisting of the Carioca high society, reacted with a frigidity that became notorious. Carmen, who had once struggled against “accusations” of being Portuguese, now had to deal with insinuations about being “Americanized”. Deeply shaken, she cancelled all her other shows. Two months later she decided to reappear at the Cassino da Urca with a new repertoire that included the samba Disseram que voltei americanizada. It was a huge success and she was praised once again by the critics. Mas p’rá cima de mim, p’rá que tanto veneno? Why so much hatred directed at me? Eu posso lá ficar americanizada? How can I be Americanized? eu sou do camarão ensopadinho com chuchu! It’s camarão ensopadinho com chuchu for me! As we can see, Carmen’s reply embraced a reaffirmation of her links not only with Brazil, but also (and mainly) with the symbols of a “national popular imagery”. The symbolic strategy that the singer used to regain the familiarity and legitimacy she had lost could be thought of in terms of what Alfred Schtuz describes in his article The Homecomer: the inter-subjective conflicts faced by people who return to their place of origin after a long absence. 31According to Schutz, unlike the foreigner, the homecomer “expects to return to an environment of which he always had and—so he thinks—still has intimate knowledge, and which he only has to take for granted in order to find his bearings within it” (Schutz, 1979: 290). However, when homecomers do return, they realize that they are no longer part of the relationships that made up the original “us” group, and that it is up to them, in everyday relations, to re-establish the lost familiarity. According to Schutz, this is because “at first, it is not only the homeland itself that appears strange. Returnees themselves may seem different to those who have been awaiting them, and the strange air that surrounds them means they remain unknown” (Schutz, 1979: 302). 33Thus we observe that her trajectory was wholly and intensely marked by dynamics of transculturalism and hybridism that enabled her to constantly move between different cultural, social and symbolic worlds: between Brazil and the United States, between the popular and the sophisticated, between civilization and barbarism, pride and shame, white and black and between the national and the cosmopolitan. In this way, Carmen’s role as a mediator was central to her success and her conflicts. The capacity for mediation provides certain individuals with the ability to communicate culture in its broadest sense. Gilberto Velho defined it as “the ability to deal with various codes and take on different social roles in a process of metamorphosis” (Velho & Kuschnir, 2001). Carmen Miranda was without doubt one of these people. In her trajectory we can see the dilemmas of nationality manifested in the ordeals she underwent, and also see them as an example of the undeniable dialectics that bring together the concepts of the national and the cosmopolitan. 34On August 5th 1955, Carmen Miranda died alone at the age of 46 in her Beverly Hills mansion. Her body was taken to Brazil and mourned by over 500,000 people to the sound of the prophetic song she recorded in 1935 which included the words: “Adeus, adeus/Meu pandeiro de bamba/Tamborim de samba/Já é de madrugada/Vou-me embora chorando/com meu coração sorrindo/E vou deixar todo mundo/Valorizando a batucada” [Good-bye, good-bye/my friend pandeiro/samba tambourine/it’s already late/I’ll go home crying/But my heart is smiling/And I’ll leave the whole world/celebrating the batucada]. 1978 Samba: Sua História, seus Poetas, seus Músicos e seus Cantores (Rio de Janeiro, Funarte). 2000 O Guru, o Iniciador e Outras Variações Antropológicas (Rio de Janeiro, Contra Capa Livraria). 1984 A Revolução de 1930 e a cultura, Novos Estudos,2 (4): 27-36. 2007 Casa-grande e senzala; formação da família brasileira sob o regime de economia patriarcal (São Paulo, Global). 2003 O “It verde e amarelo” de Carmem Miranda (1930-1946) (São Paulo, Annablume). 1999 Carmem Miranda foi a Washington (Rio de Janeiro, Record). 1979 Fenomenologia e Relações Sociais (Rio de Janeiro, Zahar Editores). 1971 On Individuality and Social Forms: Selected Writings, edited and introduced by D. N. Levine (Chicago, University of Chicago Press). 2006 Autoria e criação artística, in G. Velho (ed. ), Artifícios e Artefactos: Entre o Literário e o Antropológico (Rio de Janeiro, 7 Letras): 135-142. 2001 Mediação, Cultura e Política (Rio de Janeiro, Aeroplano). 1995 O Mistério do Samba (Rio de Janeiro, Jorge Zahar). 7 With regard to the ambiguities and polemics brought about by the representation of Brazilian music abroad, it is worth remembering the episode when the Oito Batutas, a band formed by black musicians, went to Paris in 1922, with the support of the Brazilian government.This led to various comments being made against the dissemination of the image of a black Brazil in Europe.